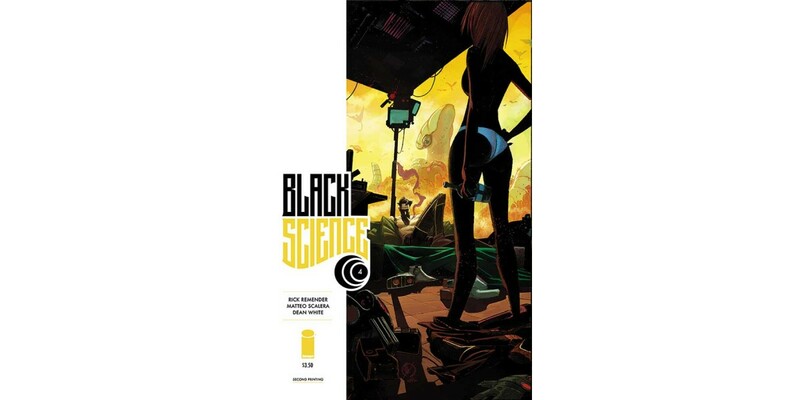 The fourth issue of the hit Image Comics science fiction adventure series BLACK SCIENCE, written by Rick Remender (DEADLY CLASS, Uncanny Avengers, Captain America) and drawn by Matteo Scalera (DEAD BODY ROAD), has sold out at the distributor level. In BLACK SCIENCE #4, Grant discovers the truth about the Pillar's sabotage just as he and his team are launched into a dimension of otherworldly beings and familiar threats. BLACK SCIENCE #4 has completely sold out at the distributor level, but may still be available in comic stores. It is currently available digitally on the Image Comics website (imagecomics.com) and the official Image Comics iOS app, as well as on Comixology on the web (comixology.com), iOS, Android, and Google Play. Image Comics is pleased to announce that this third issue will be going back to print to meet customer demand. The second printing of BLACK SCIENCE #4 (Diamond Code FEB148316) will release on 4/30. BLACK SCIENCE #5 is available in stores now, issue #6 will release on 4/30 and can be pre-ordered with Diamond Code FEB140593.